Gold is gold—but not all US gold coins are created equal. And that’s very important for anyone who wants to buy or sell them. A modern American Eagle gold coin, with a $50 face value, contains exactly one ounce of gold. These coins have been manufactured annually by the US Mint since 1986 and have become the most popular and widely accepted bullion gold coins in the world. “Bullion” coins are valued for their weight in precious metal, which in this case is gold. Although the American Eagle with a $50 face value contains exactly one ounce of gold, other metals are mixed in with it so that the coin is resilient and relatively hard, which appeals to many investors. The gold American Eagle is 91.67% gold, making it 22 karats. A 22-karat coin can probably withstand being dropped onto a tabletop without the coin being damaged. Other metals used in manufacturing gold American Eagles are copper (5.3%) and silver (3%). The $50 face value backed by the full faith and credit of the US government makes this a coin that can be spent as 50 dollars. But no sensible person would do that—if the price of gold is $1,313 per ounce, as it recently was, a one-ounce American Eagle gold coin is worth $1,313. 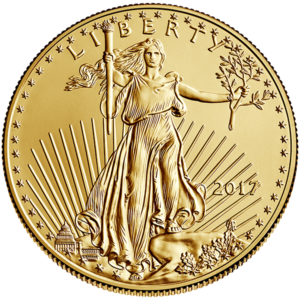 Illustrated here is a 2017 American Eagle one-ounce gold coin. However, if you are selling American Eagle one-ounce gold coins, you will probably receive a bit less than the posted gold price. And if you are buying these coins, you will likely have to pay a small premium above the one-ounce price of gold. Dealers who make two-way markets in these coins post their “bid” (how much they are offering to pay) and “ask” (how much you’d have to pay) prices. The difference between the bid and ask prices is called the spread. The spread allows you to see how much the dealer is marking up the coins over the dealer’s cost. Bullion dealers usually post their bid and ask prices on their websites along with their terms of sale. American Eagle gold bullion coins are issued in different denominations with gold weights other than one ounce. These coins are referred to as “fractional” gold American Eagles. A half-ounce gold American Eagle has a $25 face value; a quarter-ounce gold American Eagle has a $10 face value; and a tenth-ounce gold American Eagle has a $5 face value. With gold at that previously cited $1,313 per ounce, the half-ounce gold American Eagle is worth $656.50; the quarter-ounce gold American Eagle is worth $328.25; and the tenth-ounce gold American Eagle is worth $131.30. As pretty as they are, as an investor, what you really want with American Eagles is to make some money on them. And here’s where it gets a little less straightforward. 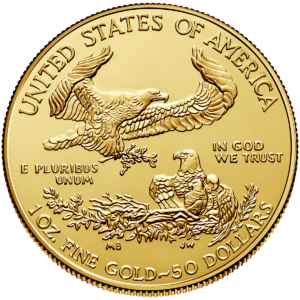 The fractional American Eagle gold coins often carry premiums over the value of the gold that are higher than the premiums of their one-ounce gold counterparts. Most of the time, I recommend purchasing one-ounce American Eagle gold coins, as the great majority of the U.S. market in gold bullion coins is for the one-ouncers—and, consequently, they have the lowest, most-stable premium and are relatively easy to sell. 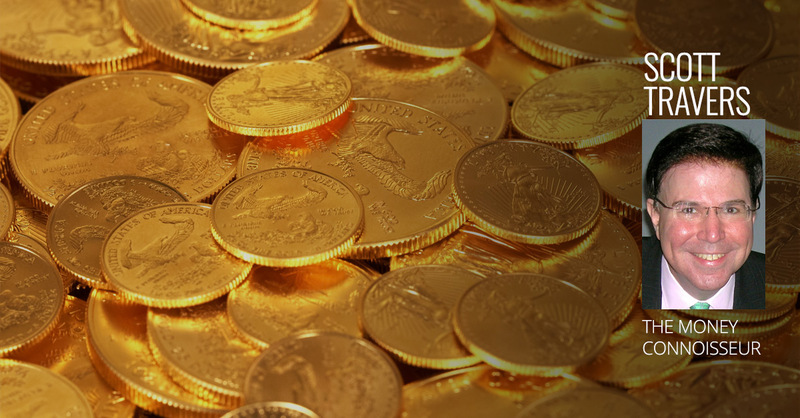 American Eagle gold coins are especially popular around April 15th, as the Internal Revenue Service allows these coins to be placed in IRAs under the auspices of an IRS-approved custodian. Make certain you consult your tax advisor before attempting this on your own because there are specific rules that must be followed. One other type of U.S. gold bullion coin that is almost as popular as the American Eagle is the American Buffalo gold coin, first issued by the U.S. Mint in 2006 to much fanfare because of the coin’s beautiful design. Investors who like pure gold especially like the American Buffalo, as it is 99.99% or 24-karat gold. The U.S. Mint even includes the wording, “.9999 fine gold” on the coin’s reverse. But going back to dropping your gold coins onto the proverbial tabletop: The American Buffalo gold coins would not fare as well as the American Eagle gold coins because pure gold, what American Buffalos are made from, is quite soft. And that does matter if you’re an investor—an American Buffalo with a ding on the edge would be discounted by $30 or so. Although American Buffalo gold coins were manufactured in the same one-ounce and fractional issues (half-ounce, quarter-ounce and tenth-ounce) as their American Eagle counterparts, the Buffalo fractionals trade at substantially higher prices than Eagle fractionals of the same denominations—and that’s not because they have a bit more gold in them. Fractional Buffalo coins were issued only in 2008, and today these coins trade for large premiums over the melt value of the gold because there are few available and many collectors want them. One-ounce Buffalo gold coins, however, trade at the same small spreads as one-ounce American Eagles. No post on gold bullion coins would be complete without a mention of the remarkable scenario currently playing out in vintage U.S. gold coins from the late 1800s and early 1900s. Many well-preserved relics of history can now be purchased at prices just a little higher than the melt value of their gold. That’s pretty stunning when you think about it—you can get a beautiful, 100-plus-year-old gold coin for essentially the bullion value and pay very little for a well-preserved piece of history. And here’s why: A number of European banks are reportedly holding several million of these early US gold coins and systematically selling thousands at a time. These vintage “double eagle,” $20 face-value gold pieces that are slightly circulated (passed from hand to hand, causing a tiny bit of wear from friction) or flawed Mint State (uncirculated with scratches) contain 0.9675 ounce of gold apiece and were once considered collector coins, and some are even certified in lower Mint State grades by leading grading services. In fact, there are so many Mint State $20 gold pieces from the late 1800s and early 1900s being released that the market is unable to absorb them, and consequently, some are being sent directly to refineries to be melted for their gold content! With gold at $1,313 per ounce, one of these classic $20 gold pieces contains $1,270.33 worth of gold. Many gold experts, myself included, see this as a wonderful opportunity to buy gorgeous and historically interesting U.S. gold coins that contain nearly an ounce of gold apiece priced at bargain basement levels. 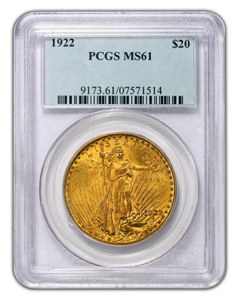 Below is a photo of one of these beauties, a 1922 Saint-Gaudens double eagle graded Mint State-61 by the Professional Coin Grading Service. Also, if possible, transact your gold bullion coin sales between 9 am and 2 pm Eastern time, when the gold market is open. After-hours gold purchases can carry additional premiums of one or two percent. Selling your gold bullion coins to a dealer after hours could result in an additional discount (bad for you) of one percent.